I got this recipe from this website the other day. I had a friend that gave me a bunch of delicious zucchini from her garden, so I had to find SOMETHING to do with it besides make a ton of zucchini bread. Heat 2 T Olive Oil in a skillet, and then add the zucchini until it's slightly browned. DON'T cook it for very long, mushy vegetables are gross. Plus, it cooks more later. Remove the zucchini from the pan. Add in chopped onion (1/4 onion or so) and 1 clove garlic. Put in the tomatoes (or carrots) and heat. Pour in 1/3 cup chicken broth. Scrape the bottom of the pan and get it all mixed in. In another bowl, stir together 1/3 cup chicken broth and 1 T Corn Starch. Stir this mixture into the vegetables and add about 3 T sour cream. Stir to combine. Add the zucchini back in and turn off the heat and just let the flavors combine. 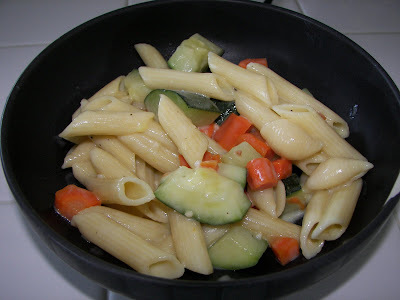 Stir this mixture together with your cooked pasta and enjoy!